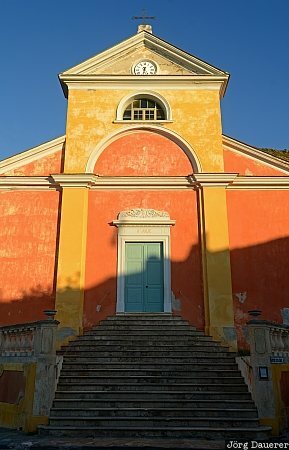 The stairs and the colorful front of the church Sainte Julie (Eglise Sainte Julie) in Nonza illuminated by warm evening light below a perfect blue sky. Nonza is in on Cap Corse in the north of the mediterranean island Corsica, France. This photo was taken in the evening of a sunny day in September of 2011. This photo was taken with a digital camera.